Persona 5 the Animation continues to impress with a strong third episode. Quite a lot happens in the space of this 23 minutes and it introduces a few of the major Persona 5 story mechanics and themes that we’ll be seeing a lot of going forward in the series. And even a new party character. Although a lot happens in the episode, it’s presented well and the overall pacing of the episode felt great. Episode 3 begins inside of another Velvet Room dream sequence. Here Igor welcomes Ren, seemingly congratulating him on gaining his first Persona comrade before reinforcing to the viewer what Palaces are, that Kamoshida views the school as his castle and that the students are his slaves. Then the next day Ren and Ryuji are at the train station, it’s clear Ren has told Ryuji about the dream. They go on to agree that Ann and the other students they saw inside Kamoshida’s palace aren’t real but are just Kamoshida’s manifestations of them. They decide it’s time to investigate further and want to start at the school volleyball club. Back at the school, Kamoshida is still up to his bullying antics, spiking the volleyballs directly at students. 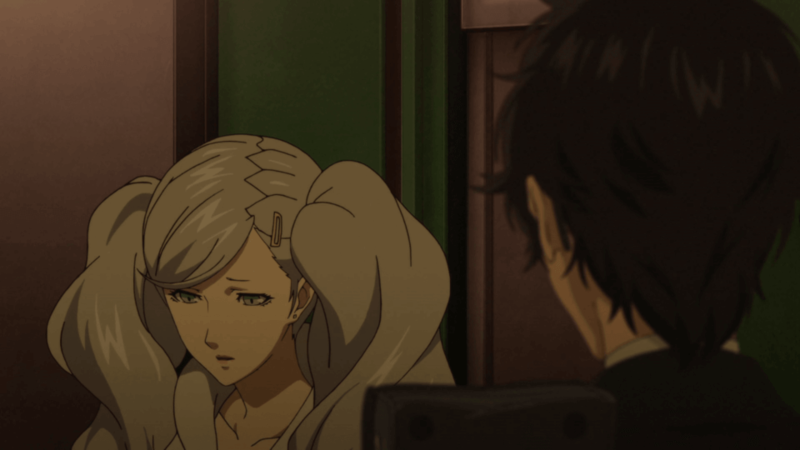 Ren and Ryuji start questioning whether Ann and Kamoshida are really ‘together’ as the rumours suggest and then begin questioning those on the team. But none of them are willing to talk or stand up to Kamoshida. 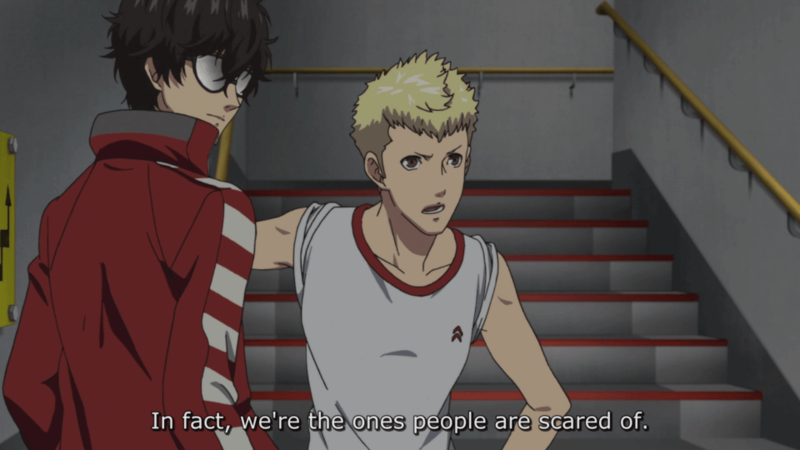 And based on the murmurs still occurring around school, the students seem to fear both Ryuji and Ren than they do Kamoshida because of the rumours he’s spread about them. We then get to meet Shiho properly for the first time, she did briefly appear in the last episode but wasn’t featured or introduced. She’s also a member of the volleyball team and it doesn’t take a genius to figure out why she’s covered in scrapes and bruises. 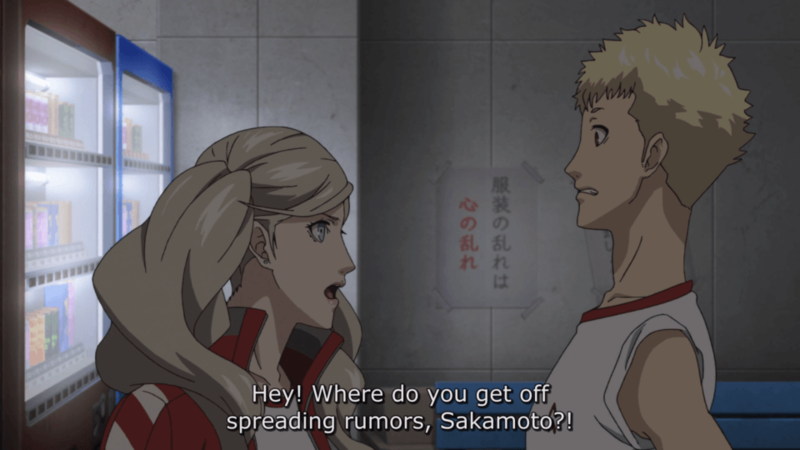 Ren & Ryuji begin to question Shiho about Kamoshida but they are interrupted by Ann who warns them about spreading rumours before taking Shiho away. It’s clear she is quite protective of Shiho. This scene is followed by a brief foreshadowing moment taking place back in the present day interrogation room. Where Ren is questioned about a tragic event that occurred at the school. The view then shifts back to the school to continue the story. Ren witnesses Ann taking a phone call at the train station. She mentions Sensei and that this person shouldn’t cut Shiho from the team, it’s obvious she’s talking to Kamoshida. Ren see’s her getting physically upset and the two go and get a drink together. Here she reveals that she and Kamoshida are not ‘together’ as the rumours state and that she is being blackmailed as he has mentioned Shiho is too kind and emotional to be on the volleyball team and will cut her from the team if Ann doesn’t submit to him. Ann is suffering because Shiho is her only friend and she doesn’t want her to get hurt. Back at school, the injured student we saw earlier in the episode visits Shiho to pass on a message, Kamoshida want’s to see her in his office. 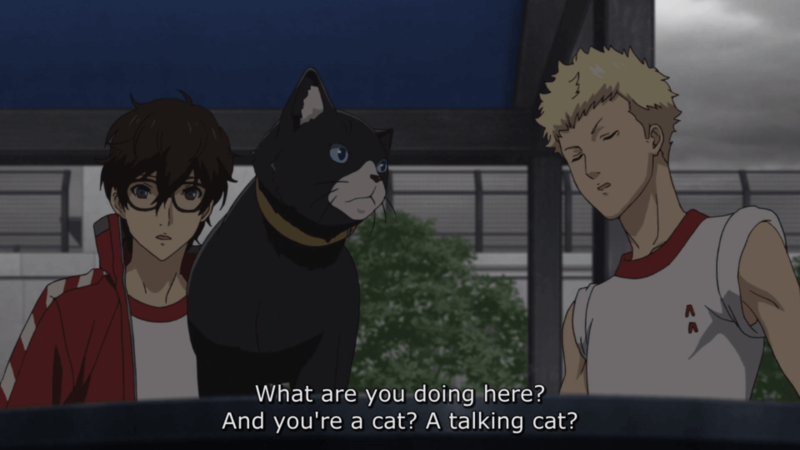 The next day Ren and Ryuji get interupted by a talking cat. It’s Morgana, who mentions he isn’t a cat, it’s just the form his body took when he came there. He informs Ren and Ryuji that there is a way to reform people using their Palaces, but it is a risky process and can result in death. This ability to change people’s hearts becomes the core plot motivator for the most of the Persona 5 game and will likely be the driving force in this anime as well. Next day in class we get our first look at the incredibly stylish messenger app Ren uses on his phone. It too is a perfect recreation from the one seen in game. The two agree that they don’t want to be responsible for the death of a person and decide they should find another way to out Kamoshida’s true nature to the world. Then the students in class notice something out the window. In a silent scene upon the school roof we see Shiho standing on the ledge before slowly free falling to the ground. 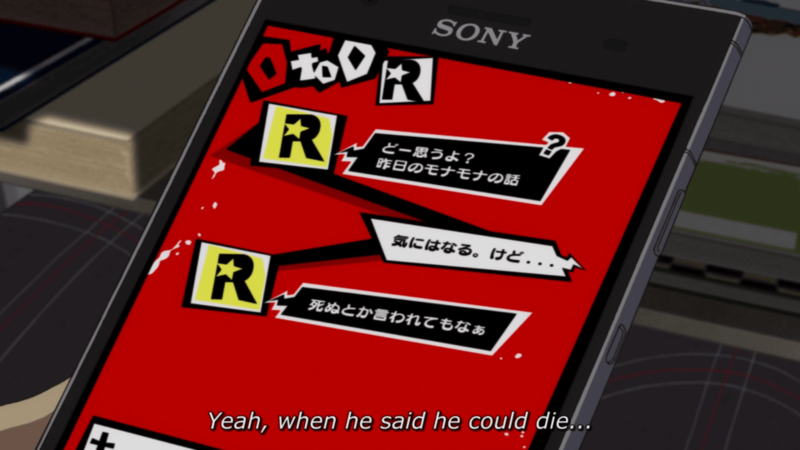 Ren and Ryuji catch up with the injured student that passed on the message and we now learn his name is Mishima. He tell’s them everything about Kamoshida and together the 3 of them storm Kamoshida’s office to call him out on his abusive ways. 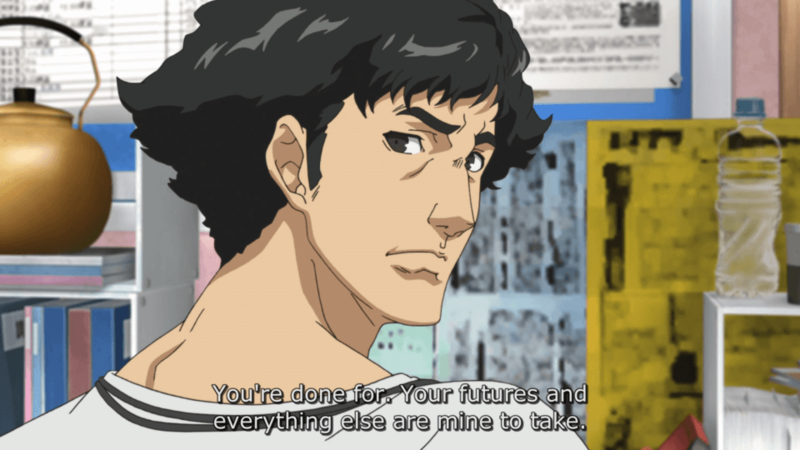 Kamoshida’s next words cement him as one of my most hated characters in all of anime. He tell’s the three of them that they have no proof of what he does to the students and Shiho is currently in a coma, even if she does wake up she’s likely to be a vegetable. Ren hold’s Ryuji back from attacking Kamoshida right in the office. He then tells the group that he’ll be reporting them at the next board meeting and having them expelled. Before revealing he did blackmail Mishima to spread the criminal news about Ren around the school. This guy is truly the Joffrey of anime. With no other options, Ren suggests that they hear Morgana out. Kamoshida needs to be taken out and after showing zero remorse, Ren seems to feel less guilty about re-entering his palace to do so. Ren and Ryuji jump back into the metaverse but are spotted by Ann who was close by as they travelled. Inside the palace they discuss the idea with Morgana and learn that a person can be changed mentally if their Palace is erased. It will forever change the person’s heart. Although there is the chance that upon being faced with all his wrong doings, he may have a full mental breakdown and could die. To erase a Palace it’s treasure must be found and stolen. Kamoshida’s treasure is located at the centre core of his castle, the core of his desires. The group hear an alarm signalling another intruder is in the Palace and run to check it out. 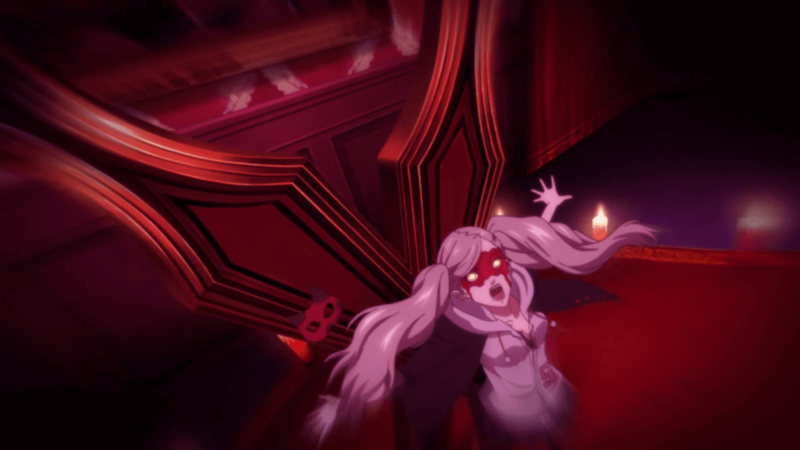 They find it is Ann who has been pulled into the metaverse with them and was captured by Kamoshida who begins to torture her, while shadow Ann watches. He guilt’s Ann by saying Shiho jumping was her fault. When she wouldn’t submit and give him what he wanted he turned and took it out on Shiho. This rush of emotions allows Ann to awaken her Persona Carmen, she breaks free of her restraints and destroys Shadow Ann. Kamoshida begins his retreat by summoning the Belphegor demon and other Persona’s to attack Ren and the others. The battle scene follows the turn based nature of the game, culminating with a 4-way All out Attack that defeats all the enemies. Back outside the metaverse the group fill Ann in on the whole Palaces, and changing people’s hearts situation and she is now able to hear Morgana speak in the real world. Morgana mentions that only those that have been inside a Palace can hear him and all other people will just hear regular cat sounds. Ann agrees to join their cause and vows to not let Kamoshida die as he should pay for his crimes. 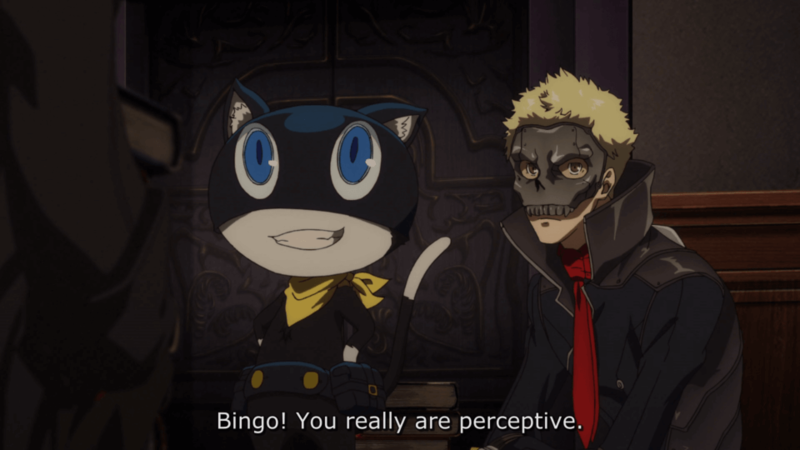 Morgana dubs the group the Phantom Thieves before breaking the fourth wall a bit and speaking to the viewer saying “there’s always a next time” before the credits begin to roll. This episode sadly didn’t have an opening credits scene but as mentioned last week, it looks as though the true opening theme may not be revealed until episode 4 or 5. 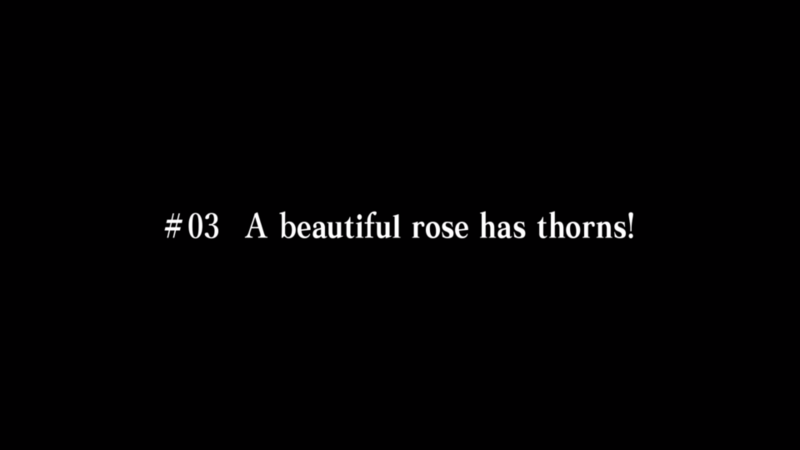 Episode 3 covered a lot of ground in just 22 minutes but it never felt overwhelming. The show is doing a great job at portraying how sinister Kamoshida really is. Something that took around 5 hours or so in the game, so this has streamlined the story but still managed to hit all the major story beats so far of Persona 5. As mentioned in the previous reviews there is some noticeable quality drops in the animation at times. More so than in episode 2, which had more than episode 1. Hopefully it doesn’t continue to get worse as the series goes on. Because in the moments it isn’t bad it’s stylishly fantastic. + Introduces new characters and core themes of the series.